What upgrades and old-time tricks should you consider for your old tractor? Is a 12V conversion a good idea? A roll bar? A comfy seat? Read on! I bought my tractor a year after moving to my 37-acre farm in Western Oregon. I needed a tractor just to keep the pastures from turning into forest. In addition, I raise free-range hens in portable houses, and the houses need to be pulled to a new location from time to time. My tractor is a 1957-vintage Ford 640. Like the more numerous “N” series tractors — 9N (1939 model) 2N (1942 model) and 8N (1948 model), it is a gasoline-powered four-cylinder utility tractor with a three-point hydraulic hitch and a PTO (power takeoff unit) on the back. It’s bigger than the N-series tractors, with about 35 HP. At the time I bought it, I thought it would be nice to have a tractor that was powerful enough to pull a ground-driven hay baler, though now I know enough people who have been injured by balers that I’ve lost interest. Type of tractor to buy. I don’t know about you, but I would never consider a tractor without a three-point hitch. Not only is this the standard, but the hitch itself is a safety device that makes it hard for the tractor to rear up and flip over backwards when an implement snags on something. So I don’t think of a three-point hitch as an option. Age of tractor. I like older equipment because it’s simple and easy to work on, not to mention cheaper. My tractor is over 50 years old, but parts are still available, and it’s still running strong. Its hugely overbuilt cast frame will last forever. But new tractors have their attractions, too. It might be a good idea to do the process backwards. First, discover who the best dealers and mechanics are in your area, and then buy the kind of tractor they like to work on. Pick a brand with some kind of track record, not the flavor-of-the-week tractor from a third-world country that’s only been importing into the U.S. for a few years. You don’t want to be stuck with a tractor for which parts are unobtainable. My Ford 640 tractor during an outbreak of teenagers. 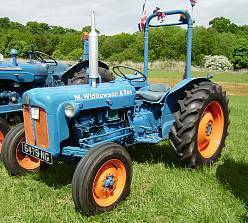 Old tractors generally have six-volt, positive ground electrical systems. Yes, you can still get six-volt batteries, headlights, and other parts, even though it’s been more than forty years since the industry converted to the twelve-volt, negative ground standard. If your tractor runs well on its original 6V, there’s no compelling reason to convert. Twelve volts mostly add convenience. How much convenience? In daily operation, just a little. In some circumstances, a lot. A 6V tractor can’t be jump-started from a 12V vehicle, and that’s a pain. I’ve jump-started tractors many, many times, so maybe that’s enough reason in itself. If you want more reasons, it’s getting harder to find a good battery charger that supports 6V batteries, and of course you have a far wider selection of accessories for 12V: everything from iPhone chargers to fancy lighting bars. Like a lot of people, I converted to 12V when my tractor’s generator failed. The generator worked worse and worse, and when I took it apart, it was a wreck. A new generator and a 12V conversion kit weren’t that different in price. What’s In a 6V to 12V Conversion Kit? I bought a conversion kit from Walt’s Tractor Parts, and was very happy with it. A Delco 12V alternator with pulley. Series resistor for your old ignition coil. What Isn’t in a 6V to 12V Conversion Kit? Some things aren’t included, either because you simply continue to use the original equipment or because you’re expected to replace them on your own. Voltage regulator. If your tractor had a separate voltage regulator, you won’t be using it anymore. The alternator has one built in. Fuses. Depending on what kind of 12V lights you upgrade to, you may need a bigger or smaller fuse. The “wiring harness” only has four or five wires in it. The kit includes a new one. This stuff ain’t rocket science. The whole process only took an hour or two. There are so few parts in a tractor’s electrical system that it all went very smoothly. I accidentally wired the ammeter backwards and have never gotten around to fixing it. A lot of the tractor’s original parts are kept—the original starter, starter solenoid, ammeter, ignition key, and (usually) ignition coil are retained. 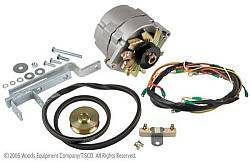 The generator and voltage regulator are removed and replaced with an alternator with a built-in voltage regulator. You need to replace the battery and the headlights. My kit came with a resistor to use in series with the old ignition coil. A lot of 12V ignition coils also use an external resistor. In the end I replaced the unit with a 12V coil with an internal resistor just to simplify the wiring a little. I noticed that the alternator doesn’t produce any output until the tractor gets up to around 1,200 RPM. This isn’t very important unless you idle it at low speeds for a very long time right after starting it. But once the alternator kicks in, you can lower the idle speed as low as you like, and the alternator keeps working. One problem that the 12V conversion didn’t help was the difficulty I had with my starter, which didn’t always engage. This was due to a damaged ring gear. It’s possible that running the original starter motor on 12V accelerated the process of ring-gear destruction, though I had been having trouble with it before the conversion, and it was probably a goner in any case. When I had the ring gear replaced (an expensive process, since it’s quite inaccessible), I also replaced the starter motor with the 12V model. It probably wasn’t necessary, but it made me feel better. By the way, if you like the idea of keeping your tractor in stock condition, you can replace 6V generators with 12V generators that look just the same. At least, you can do this with Fords. Ask your dealer. I have no interest in keeping my tractor looking original. I had a persistent problem with poor ignition on my tractor. Mostly this was caused by corrosion on the ignition points. My tractor is left out in the weather sometimes, and the distributor gets rained on. Although I’ve never seen water inside the distributor cap, it must get overly damp because the points corrode within a year or so. Net result: No more points, no more corrosion, no more lack of starting! It’s also supposed to improve starting and low-end torque. I also installed a Pertronix high-voltage spark coil. It didn’t make any obvious difference, though maybe it deserves a share of the credit for the tractor’s overall improvement. My Ford 640 tractor came with headlights at the factory, but they were long gone by the time I took possession of it. I soon learned why; headlights tend to get whacked by low branches and such, and eventually get damaged or even scraped off entirely! 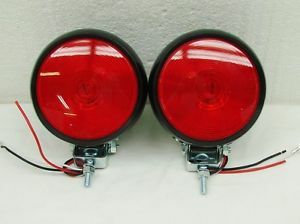 After a false start with fancy chromed headlights, I learned to buy inexpensive “implement lights” at the hardware store. These come with mounting hardware and have a hard rubber case which stands up okay to abuse. Not that they last all that long: they don’t. But they’re easy to replace. I also added taillights, which weren’t part of the tractor originally, but made me feel better. My tractor sometimes gets parked on the road as I open gates or such, and sometimes I work until it’s pretty dark. I’d hate to have a neighbor collide with my tractor because it was hard to see in the gloom. It’s hard on the paint. I also put some self-adhesive plastic reflectors on it. These didn’t last long. Reflective tape works better. You should probably put the lights on their own fuse to reduce the chances of blowing the main ignition fuse if a headlight wire shorts out. You can also put them on a completely separate circuit, so you can drain the battery when you forget to turn the lights off use the lights when the ignition is off. I was pleased to discover that rollover protection systems (that is, roll bars) were readily available for my tractor. I had the mechanics from the Ford/New Holland dealership install the model they liked best. This is the sort of thing you want to buy on reputation, not price. 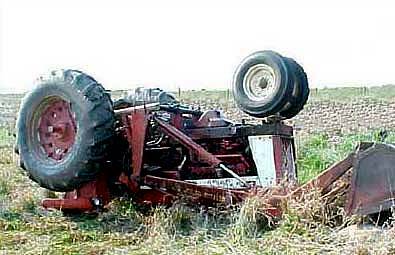 Tractors are dangerous. They have a high center of gravity. I have creeks and ditches and steep hills on my property, and it would be easy for my tractor to flip onto its side or even on its back. The roll bar is very simple, but it’s not the sort of thing you’d want to cobble together on your own. It needs to be strong and strongly attached to the tractor frame. I had the local New Holland dealership install mine. Pay attention to the safety instructions that come with the ROPS. For example, the roll bar came with strong warnings not to drill holes or weld to the roll bar, no matter how much you want to add fancy lights to it. You don’t want to mess with the roll bar for fear of weakening it. One disadvantage of the roll bar is that it makes the tractor taller. It bangs against fairly high tree branches, for example. So it’s not an unmixed blessing. Still, I’m glad I have it. The roll bar came with a seat belt. The instructions say to always wear the seat belt, since the roll bar can’t keep you from being pinned by the tractor if you don’t stay in the seat. I got rid of the steel pan seat on my tractor pretty soon after buying it. It was killing me. I replaced it with a heavily padded seat with a fancy spring suspension. I bought it by mail order. After installing it, I could spend twice as much time mowing without my back seizing up. There are a lot of different makers of replacement tractor seats. I don’t think you should even consider simple cushions for the original pan seat, but go for a tractor seat with back support. I also think that seat arms help. 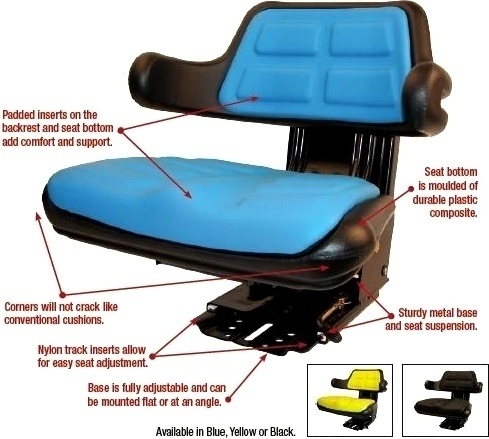 A tractor seat should be adjustable and it should have some kind of spring suspension. Mine has an adjustment so it can accommodate drivers of different weights. It’s not an unmixed blessing. It sits higher than the original seat and I can no longer reach the strange little brake-lock levers. Admittedly, I never used them even before I got the new seat. You should always wear hearing protection when operating a tractor. Tractors are very loud and have damaged the hearing of generations of farmers. You shouldn’t let it happen to you. There are a lot of hearing protection products on the market. Earplugs are very inexpensive and work quite well. I like the earmuff-style protectors better, myself. 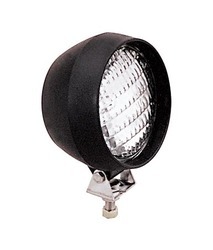 I use 3M Model 1425 Low-Profile Ear Muffs because that’s what my hardware store carries. There’s not much to say about hearing protection except that you should always use it. Every time you operate the tractor without it, you do some permanent damage to your hearing. Music helps make the chore time go faster. I like to listen to audiobooks when using my tractor, usually digital audiobooks from audible.com or the local library. I’ve been a subscriber to audible.com since 2001 and have been very happy with them. You can buy hearing protection with built-in FM radio or headphones, but I roll my own. It turns out that some kinds of lightweight audio headphones, especially those from Panasonic, have removable earpieces that are just the right size to fit into earmuff-style hearing protectors such as the 3M #1425. It takes less than a minute to do the conversion, which can be undone just as quickly. It’s much cheaper than fancy hearing protection with built-in radios or headphones, and this is important to me because I frequently damage the cords or leave the headphones out in the rain or otherwise wreck them. Similarly, I prefer simple tape players to fancy ones. I had a tape player fall out of my pocket once while I was mowing. A trip through a rotary mower didn’t do it a bit of good. For a while I used Koss earbuds alone, since they were the stick-in-your-ear kind that did a good job of blocking outside noise. But real hearing protection is better. See my audiobooks page for more tips on using audiobooks to make chore and drive time more pleasant. I’d had the tractor for years before I realized that it was abnormal for the temperature gage to stay at the “stone-cold” level unless I was working it very hard. Obviously, the thermostat was stuck open, and had been when I bought the tractor. Replacing it was a bit of an adventure. The thermostat itself is an ordinary Ford thermostat, and while Napa didn’t have a gasket for my tractor, the guy at the store gave me some gasket material gratis, and I cut a new one, using the thermostat housing as a pattern. The problem was that the housing, gasket, and thermostat refused to stay aligned while put the assembly back into the engine. In the end, I glued it all together with silicone sealant, waited for it to try, and had no difficulty putting the now-monolithic unit back on the tractor. I also replaced the radiator cap on spec. this turned out to be a mistake. As often happens with older machinery, one problem masks another. A working radiator cap meant that the cooling system could now build up some pressure. But the seals on the water pump were no longer capable of handling ordinary pressure. The right thing to do would be to replace the water pump, but leaving the radiator cap loose prevents any leakage. So far, the loss from water steaming off hasn’t been noticeable. Replacing the thermostat was a good idea, though. The engine now gets up to temperature even at idle, and it runs better. The higher engine temperature means that the oil gets up to temperature, which will boil any water from the oil and extend the life of both the oil and the engine. I once backed my Isuzu Trooper into the tractor and damaged the radiator. The radiator shop in town had no trouble repairing it very reasonably, which is worth knowing. New radiators are also available. I don’t have a trailer that can haul my tractor, so if it breaks in a way that I can’t repair, the mechanic has to come to me, or I have to arrange haulage by someone with a trailer. The local Ford/New Holland dealer will send a mechanic out to me, and I’ve been happy with them. But I prefer John’s Mobile Combine & Tractor Repair of Lebanon, Oregon, because John’s just as good as the dealer and charges less. When my starter stopped working altogether, John appeared with his trailer and took my tractor away. Replacing the ring gear on the starter involves separating the front and rear halves of the tractor. The frame of the trailer is a big hollow casting with the transmission on the inside. The flywheel is also in there, and the ring gear is bolted to the flywheel. Most of the teeth were chipped an distorted, to the point where it became impossible to start the tractor. This is not the kind of job you want to do outdoors during a rainy spring, so John took the tractor to his shop. It turned out that the clutch also needed rebuilding (which didn’t surprise me at all), so I got two overhauls that required separating the tractor done at the same time, which is just as well. John also fixed up several little things as he noticed them, which I appreciate, since I tend to let little things ride, meaning to fix them and not actually doing it. There are varius kinds of mobile repair out there. Some of my neighbors use mobile auto repair services. It’s very inconvenient to take cars into the shop when you live far from town, and often the mobile repair guys are cheaper anyway, especially if you have two or more vehicles that need some work. Some tire stores such as Les Schwab also offer mobile service, which can be important for tractors and other vehicles where the wheels are far too large to toss in the back of a car. All these services end up charging you for mileage one way or another, but in many cases you come out way ahead, either because you saved so much of your own time and could get a lot more work done, or because their rates are so much lower than the dealer’s that you came out ahead that way. Another service worth mentioning is mobile veterinarians, who don’t maintain an animal hospital at all, but work solely out of their trucks. They’re usually less expensive than standard vets, since they’re solo acts and don’t have employees or storefronts to maintain, and a lot of them work with both pets and farm animals. Maybe you’d find it convenient for them to come to you, even if we’re talking about a cat rather than a cow. I use Marvel Mystery Oil as a gas additive for my tractor. Marvel Mystery Oil is a penetrating oil that tends to dissolve rust. When added to the gas in a tractor with a steel gas tank, it leaves a thin coating of oil on everything, preventing additional rust, while tending to dissolve the rust that’s there. I have also had some trouble with rust in my carburetor, and it helps there, too. I used to always have some red rust in the sediment bowl of my carburetor, but this has gradually vanished since I started using Marvel Mystery Oil in the gas. Admittedly, I could also pay to have my gas tank sealed, or even replace the tank with a new one. But I won’t do this until I have to. 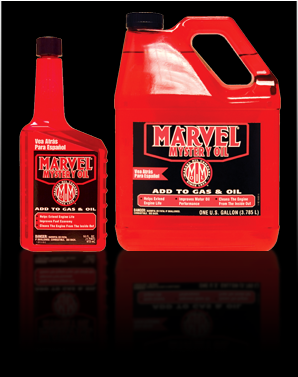 I doubt that Marvel Mystery Oil is of any particular use as an oil additive, since today’s oils are already pretty good, but in old tractors and cars, especially with steel gas tanks with some inside rust, Marvel Mystery Oil good stuff. I also use it as a general light lubricant and penetrating oil, though I’m told that as a rusty-part loosener, Kroil is better. I need to try it some day. I have the Ford user’s manual for my Ford 640 tractor and also the ITC manual. I think it’s very important to do all the periodic maintenence in the book. Old tractors totally lack the lifetime lubricated bearings and other modern conveniences, and as a result you’ll end up using a grease gun a lot. I was amazed at how a tractor goes through fluids! The oil-bath air filter uses 1.5 pints of oil every time it’s changed, and it should be changed every 10 hours of operation (partly because the crud and water tends to sink to the bottom, so you can’t really tell if it’s clean or dirty). I don’t know of a conversion kit that would convert my tractor to a paper air filter. Too bad. The engine oil is supposed to be changed every 50 hours. Possibly this is overkill, since modern oils are so much better, but tractors work in a very dirty environment and some of the dirt finds its way into the engine. Better safe than sorry. The original spec says to use single-grade 20W or 30W oil, but multi-grade oils are better. I’ve pretty much standardized on 15W40 diesel grade oils in all my vehicles (even though none are diesels!) because it’s more than adequate for everything I have, without being so fancy that it’s going to break my bank account. I don’t suppose you can go far wrong with 10W30 or 10W40 or 20W50, either. The original cartridge filter spills about a quart of oil on the ground every time it’s removed. I have a conversion kit that allows it to use an ordinary spin-on cartridge. I got this from the local Ford/New Holland dealer. This will make filter changes less messy and will probably provide better filtration. Also, the original cartridges don’t have a bypass valve, so bad things could happen to your engine if the element got clogged. I’ll install it at the next oil change. Don’t neglect the grease fittings, which should get a shot of grease every 10 hours of operation. The purpose of this is to keep crud from penetrating to the interior of the fittings. The first time I greased the fittings, water, rust, and very dirty grease came out of some of them! Keeping the fittings greased only takes a few minutes. My tractor also has filters on the crankcase and head, which are supposed to be sloshed around in kerosene to clean them and then be lightly oiled. Bad things happen if these clog or if the crud on the outside works its way into the engine. I keep a coffee can about half full of kerosene for this purpose. And don’t forget to check the dipsticks for the engine oil and hyraulic fluid! All this work leaves your hands disgustingly dirty. I recommend Goop hand cleaner. They must have reformulated it, since I seem to remember it stinking to high heaven when I was a kid. It’s odorless now. It takes the grease right off, isn’t harsh, and even works great at removing stains from your clothes! I need to find a wall dispenser for it, since it’s hard to open the jar with greasy hands. In addition to all that daily/10-hour maintainence, there are longer-term tasks such as occasionally draining and refilling the transmission and rear end. I was surprised to discover that my transmission had very clean oil in it, but the differential had dirty oil, and the drain plug came out with a slurry of very fine metal particles on it! Some previous owner had skipped a lot of routine oil changes. I went through about four gallons of gear oil when changing those two sets of fluids. Gear oil isn’t very expensive, but the sheer volume was impressive. Ford/New Holland North America. Ford, in a fit of corporate insanity, sold its tractor division to New Holland, which in turn has become Case New Holland. It’s always sad when the mergers start, because the resulting zombie companies usually aren’t good for much. But New Holland has a surprising range of parts for ancient Ford tractors, and the guys at the local dealership are great, so maybe there’s life in the old boy yet. Yesterday’s Tractor is an old-tractor site with everything. They have stuff for sale, classified ads, and online forums where you can post your tractor questions and get useful answers! Antique Tractor Internet Services is another old-tractor site. They have a list of tractor salvage yards, in case you feel like getting those hard-to-find parts or acquiring a parts tractor. Tractorlinks.com. A tractor link site. The Combine Demolition Derby in Lind, Washington is worth reading about.